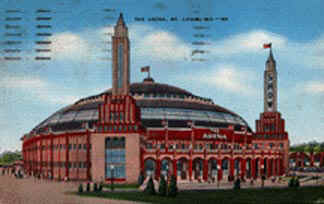 This postcard is of the St. Louis Arena and is postmared 1941. 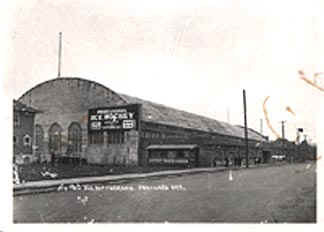 On the back it reads as follows: The Arena used for exhibits, shows, prize fights and wrestling matches, is at 5700 Oakland Avenue, at the southern edge of Forest Park. It is a huge structure without supporting pillars to mar the view. It seats more persons than Madison Square Gardens. It is flanked by two additional exhibit halls. 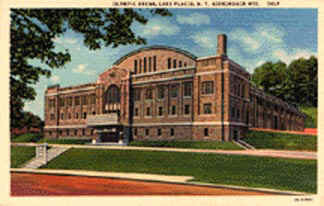 These postcards are of the Olympic Ice Arena in Lake Placid, New York. The postcard on the left simply states - Olympic Arena, Lake Placid, N.Y. Adirondack Mountains. 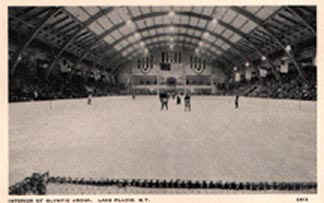 The postcard on the right says - Interior of Olympic Arena, Lake Placid, N.Y. In addition of the right one it also says that the III Winter Olympic games were held at Lake Placid in February 1932.They probably are from the 1930's to 1940's. 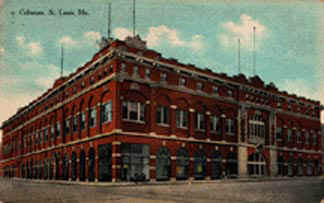 This is a photo postcard of the Hippodrome that was home to the Portland Rosebuds of the old Pacific Coast Hockey League. This photo dates back to the early 1920's. The sign on the building says Professional Ice Hockey - Fastest game known - Portland vs Victoria, B.C. - Tues., Feb 9th, 8:15 P.M.